I was inspired by the current sketch over at Operation Write Home Stars & Stamps: Sketch #105, when I made this card. This is a very simple design that showcases the pretty die cut. I was able to use some paper I’ve had for quite awhile, which is always a good thing. Thanks for stopping by. 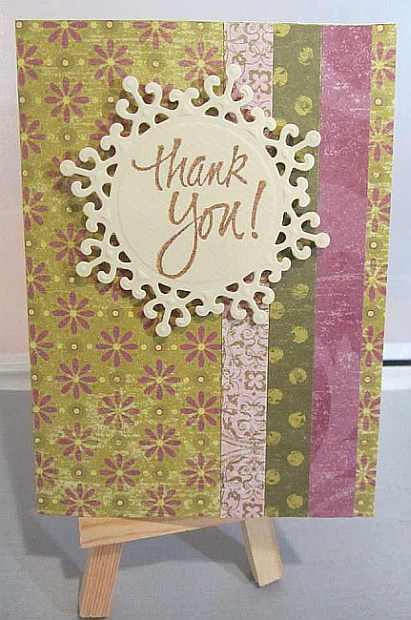 This entry was posted on Friday, January 27th, 2012 at 11:00 pm	and tagged with cardmaking, clean and simple stamping and posted in Challenges, OWH, Thank You. You can follow any responses to this entry through the RSS 2.0 feed. Great card, Yvonne! Love that combination of papers! Thanks for joining us in this week’s OWH Stars & Stamps Sketch Challenge! Great combination of papers and the Spellbinders die is really pretty. It’s one I haven’t seen yet. Very nice card!